Students with special needs have the chance to participate in the Job Olympics. Though it is comparable to the Special Olympics, the event focuses on career-related competitions rather than sports. Ten different local schools participate in this event. In West Bend, students can prepare for the Job Olympics by enrolling in the WORKS program. 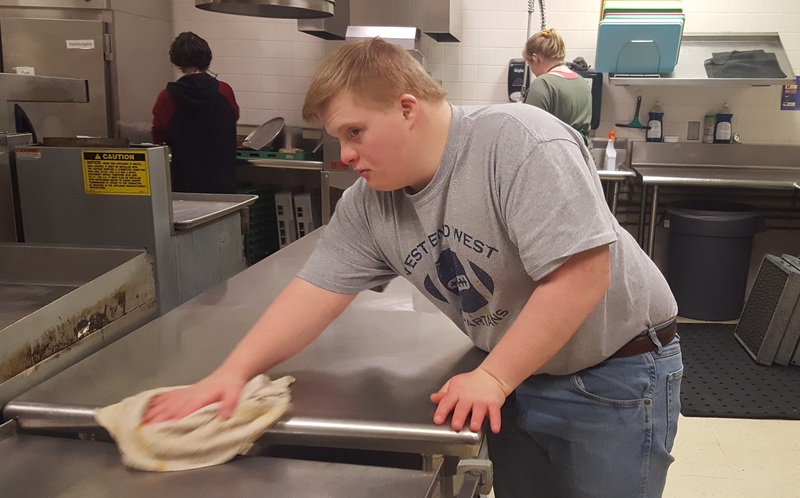 The elective course gives the opportunity for students with special needs to learn everyday tasks and, sometimes, eventually hold a part-time job. Students attend the class anytime from one to three hours during school, and they often travel to places outside of school to explore careers. Samaritan Health Center, Piggly Wiggly and Kettlebrook Community Center are just a few local businesses that welcome the students. Responsibilities that the students master include working a vacuum cleaner, making phone calls, counting money, bagging groceries and just being happy, as one student said. These experiences help familiarize the students with the skills judged at the Job Olympics. 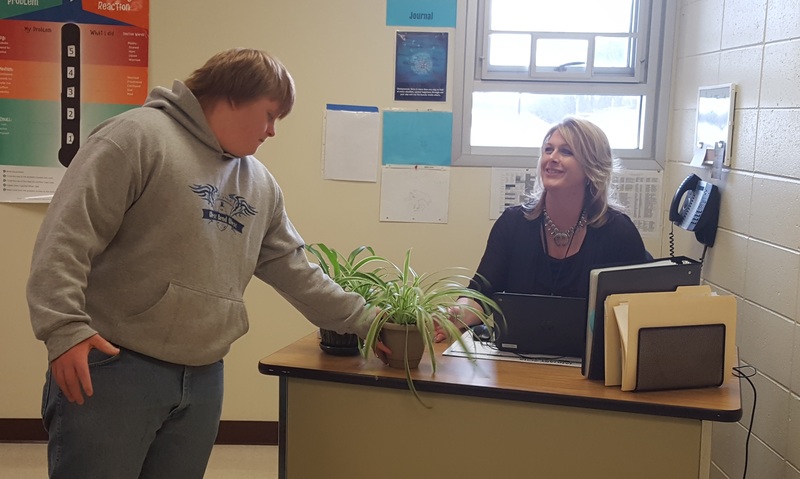 Spencer Titus, West junior, delivers a plant to Amy Bintz, a special education aide. Photo taken Jan. 29 by Jessica Steger, Editor in chief. Individually, the students take on a certain level of responsibilities and complete them for a judge. This event is enjoyed widely by all the students and is a gratifying experience after all of their hard work throughout the year. Mike Huettel, a WORKS program staff member, says the event is valuable to the students because they are included in the community as well as with other students. He added that the staff who have assisted the students all year enjoy watching the competition. “It’s awesome to watch them, it always brings a smile to my face,” Huettel said. Maus says the hope is that the skills used in the competition will be used in the future. “Our main goal is for them to build skills so that they can go out and maybe hold a part-time job eventually,” Maus said. According to Maus, assisting someone in their daily job gives the students a sense of importance, whereas sitting in a classroom does not provide the same feeling of accomplishment. “Sometimes my work coordinator ‘disappears’ in the workplace, which teaches responsibility,” said Andrew Troedel, an East junior in the WORKS program. Because of this option, the students can celebrate success, such as working independently or even getting a job offer. Right now the program holds more students than ever before, and 75 percent of them have explored careers. When they are not learning skills in the workplace, students also have the duty of delivering plants during school hours. The Rent-a-Plant business is open to staff at the high school. They purchase a plant every week, and it is the students’ job to take care of them. The plants are picked up on Fridays, given water and sunlight, delivered on Mondays, and the process starts over again each week. Every day that the students attend school, they receive money toward their Pay Day. After paying their bills, they have $13 left to spend on food, stuffed animals and other prizes. 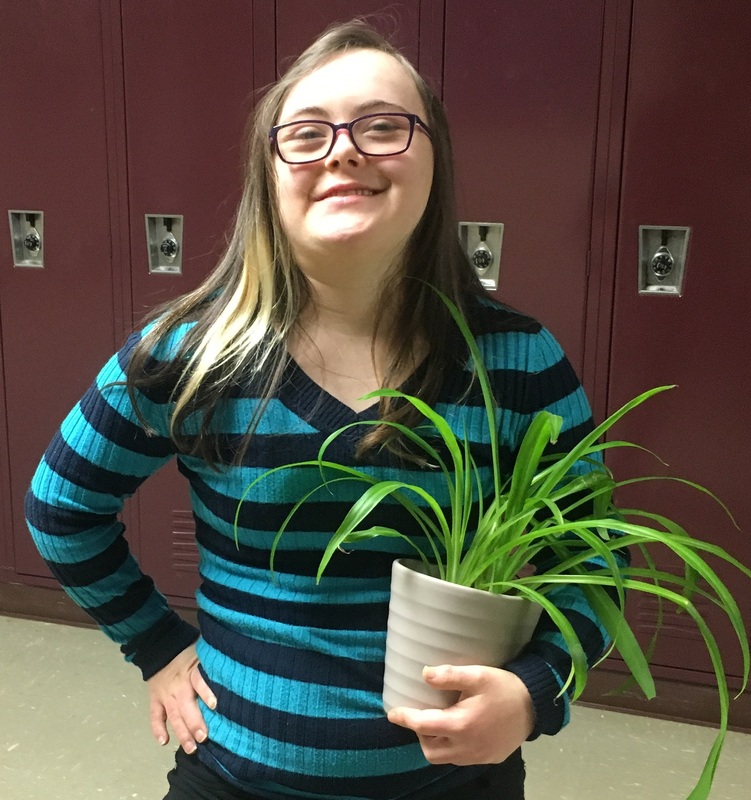 Olivia Orth, West junior, works with the Rent-a-Plant program. Photo taken Feb. 2 by Gabrielle Diaz, Current Staff. It is very often that the students’ parents ask for their child’s schedule to be changed around so that they can be in the program for more hours. “Once the kids are in here, a lot of times they’ll go back and say, ‘Can I go back and do it again next year?,’” Maus said. Huettel said that his son went through the program, and he is now 26 years old. His experiences with the WORKS program influenced Huettel’s decision to take this job three years ago. WBHS also has a program where older students can assist in classrooms throughout the school. Huettel said that these students will often stay and eat lunch with those involved in the WORKS program. According to Huettel, everyone is valuable and inclusion encourages the students. “If you see somebody sitting by themselves, they probably don’t want to be by themselves, go say hello to them,” Huettel said. The WORKS staff would like to thank Green Tree, Fair Park and McLane Elementary Schools and the following businesses for their support and involvement with the program: Bob’s Auto, King Pin Bowl, A1 Auto Body, Fair Bank, Little Lambs Child Care, Good Shepherd, Samaritan Health Center, Piggly Wiggly, Today’s Dentistry, Dublin’s and Kettlebrook Community Center. 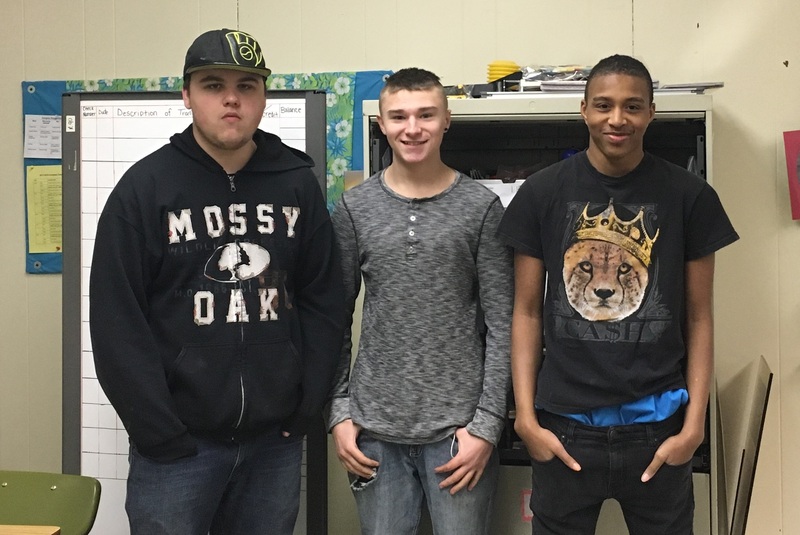 Left to right: West junior Dakota Guillaume, West sophomore Christopher Schramm-Blake and East junior Jayden Denter are enjoying the WORKS program. “Mrs. Maus is just so amazing that I’m speechless,” Guillaume said. Photo taken Feb. 7 by Lauren Oppermann, Current Staff. As a sibling of a special needs student, I really love this opportunity. I always see students delivering plants to my 4th hour class, but I didn’t know what it was for until I read the article. Pretty neat! Wowwww!! Such an inspiring piece that really captures the true meaning of opportunity. Thanks for the amazing article!!! Terrific article, written by someone who truly showed an interest in our students. Thank you Lauren. Many of these amazing students, under the direction of Mrs. Maus and Mr. Huettel, also do the final cleanup of The Nifty Nibble three days per week. I am so thankful for their services! WIthout them, I would be lost!